How to describe the last 3 weeks on the road…? First, I have to admit something to you… I am a real city girl! And from the start, I made a few blunders and miscalculations on how the camping was going to go. For example, I did not realize how much time it takes to set up a tent or to get ready in the morning. It is not like you can jump in the shower and be ready in a jiffy! Even brushing your teeth takes time, as you must get the water out of the car and find a tree trunk to set up your morning routine… Complicated, right? Especially for someone who has not done much camping in her life! And I had not given enough thought to the fact that this would be for the long haul, not just a weekend in the woods. I also now realize how easy it is to look nice and well-kept when you have a mirror/bathroom and tools at your disposal, blow dryer, etc... So, I made life easier for myself and cut my hair in Albuquerque… Forward with the tour. What has been a success is the heartwarming folks we got to meet. 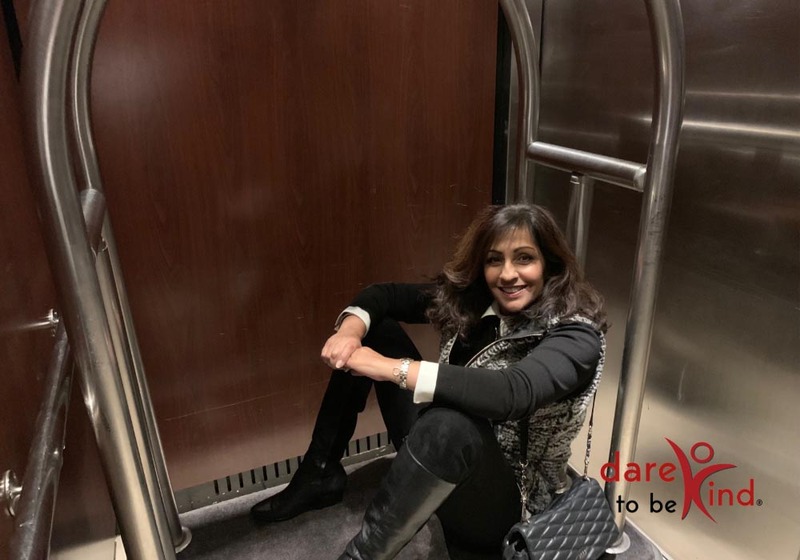 Bobbie, my manager, and I have met such genuine interest in the Dare To Be Kind movement that it gives us the courage to continue. Bobbie drives the bulk of the trip so that I can keep up with lining up interviews for the Dare To Be Kind TV show (more on that in a moment! ), social media, videos, and storytelling. We have also noticed that when people realize we are on a timeline, they are willing to accommodate us to speak in their communities instantly, knowing that we travel onward within 2 days. Luckily, we now have a tentative outline of the places we will be traveling to, and if you click here, you will see there are no dates listed, as we might stay 3 days at some places to accommodate where we are needed. 1. Help 1 person a day. Even if that is all this tour accomplishes, I'll consider it a success. 2. Gather footage for the Dare To Be Kind TV show! This show is all about pushing kindness back into the news cycle. It’s for everyone who is sick of all the negativity in the news and who wants to see positivity in action! I will be (and have been) interviewing associations doing a stellar job in their communities + people who've taken up the challenge of 1 act of kindness in a 2-mile radius. 3. Show how kindness can be used to create safer communities and healthier relationships. We want to meet up with each and every person on our route who wants to meet us because this movement is about each and every one of us! So we will deviate to accommodate everyone within reason. You are wondering how we are going to afford this...? Good question and I’m glad you asked! First, most of our speaking to schools/communities/churches are being done pro-bono or just for whatever amount they want to donate. Instead, we are asking companies/corporates to sponsor our activities, either by a direct donation, or by having me speak at their company function. The funds received are then channeled into bringing the movement to your community. So, don’t think we won’t come to you if you don’t have a budget. Second, we’re working on an exciting way to get the Dare To Be Kind TV show made and out there! So stay tuned because we’re going to have that ready any day now and you can be a part of it! 	or if you have a story on kindness you want to share! Subscribe to G's newsletter for musings, content, the latest kindness research and more. © 2019 Gabriella van Rij. All rights reserved.